New Winter 2018: Let the celebration begin when a large family can all share the joy of the holiday season together! 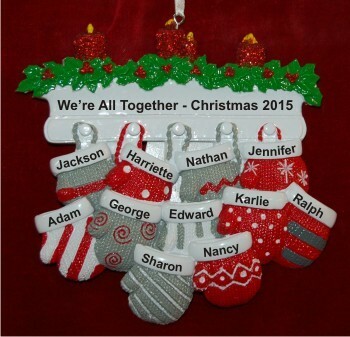 The all 11 of us together for Christmas personalized ornament will bring smiles to all with its beautiful mantel and a mitten for each person present. As one of our personalized family ornaments, we paint on all the information in a font more stylish than shown, so you receive a personalized Christmas ornament that is one of a kind. Affordable enough to have one made for everyone, the family of 11 mittens and mantel personalized ornament arrives in our classic velvet gift pouch with a display cord attached. All 11 of Us gifts Oct 7, 2017 Paula J.